A former soldier relates his experience with regard to the destruction of Palestinian olive trees while on patrol with the Israeli army. There was one incident where already the night prior, they said a ‘price tag’ action was going to be carried out. It was known. And, the next morning, a whole grove of olive trees was discovered chopped down – 65 trees chopped down. Now, chopping down a tree is an affair that takes a good half hour – it’s not as simple as it looks. Chopping down one tree costs approximately 5,000 shekels (around $1,300). You need equipment, special saws. The trees can collapse, so you chop them down in stages. To chop down 60 trees you’d need something like eight hours of work and three saws. There were lots of people there, with lots of equipment, who’d need a supply of water – it’s not a simple operation. I don’t believe that the military, with all it’s observation points, on an olive grove located on the main road, didn’t see something like that taking place. The observation posts are efficient to the degree where you can identify any vehicle that stops for a moment on some route – it’s impossible 60 trees were chopped down and no one noticed. No way. So, they brought over the military tracker to figure out where the footsteps had come from. It was taken to the deputy battalion commander, and he asked me, “Do you really want to start a fight with the entire sector now? I can’t do anything, it’s at the brigade level.” The next day, a protest tent was set up, a canopy with a few Bedouin women sitting under it in black dresses to mourn their olive trees that’d been chopped down. How did you scatter them? This testimony can also be read in Hebrew. Local sources said the kidnapped Palestinians have been identified as Raed Fathallah Naseef and Nihad al-Edreesi. Another Palestinian, identified as Wajdi a-Qutub, from Tal area, in the northern West Bank city of Nablus, was kidnapped was kidnapped after the army invaded the al-Ma’ajeen neighborhood in the city. 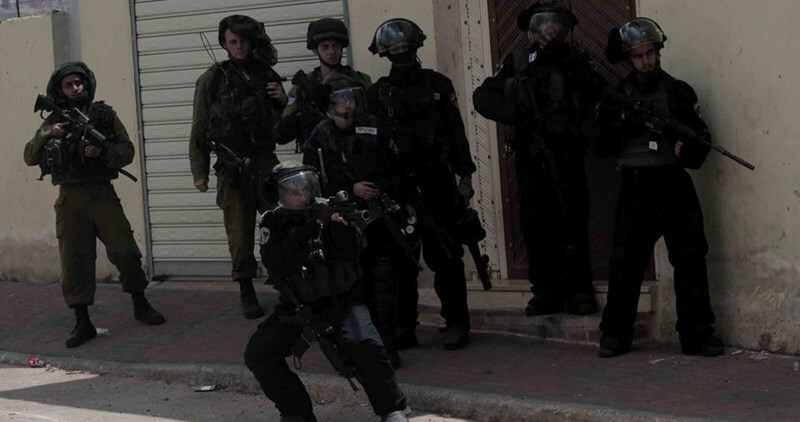 The soldiers also invaded homes in Hebron city, and kidnapped one Palestinian, identified as Khabbab Hamad. The Popular Committee against the Annexation Wall and Colonies in Bil’in village, west of Ramallah, has reported, Friday, that Israeli soldiers used excessive force against the weekly nonviolent protest, causing dozens of injures, and leading to burning farmlands. The committee said that dozens of soldiers were deployed at the western entrance of the village, and fired dozens of gas bombs and rubber-coated steel bullets at the local, Israeli and international protesters. Dozens suffered the effects of tear gas inhalation, while fires broke out in olive orchards, and wheat fields in Khallet al-Fool area, west of the village, due to the intensity of Israeli gas bombs. The lands are owned by a Palestinian identified as Awad Yassin. The protesters marched from the center of the village carrying Palestinian flags and posters, calling for the release of all political prisoners, especially journalists, and ongoing resistance against the occupation, until liberation and independence. They also marched marking the 49th anniversary of the Naksa, when Israel occupied the rest of Palestine in 1967, and marking the 15th anniversary of the death of senior political leader from occupied Jerusalem, Faisal Husseini. They denounced the continued imprisonment of the General Secretariat of the Palestinian Journalists Syndicate (PJS), Omar Nazzal, along with around 20 other journalists, in addition to calling for the immediate release of hunger striking detainees, held by Israel under arbitrary Administrative Detention, without charges or trial. 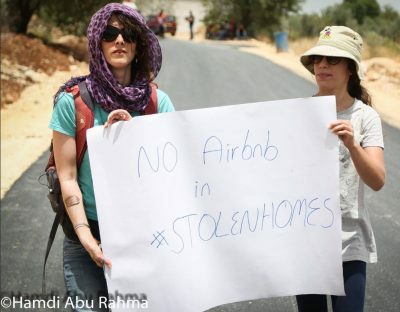 In addition, the protesters carried posters denouncing Airbnb and Remax for listing vacation rentals in illegal Israeli colonies, built on stolen Palestinian lands in the occupied West Bank, including Jerusalem, and called for national unity, liberation and independence. Coordinator of the Popular Committee against the Wall and Colonies in Bil’in, Abdullah Abu Rahma, called for ongoing popular resistance against the Israeli occupation, and its government that is accelerating the confiscation and theft of Palestinian lands in order to build and expand illegal colonies, and the demolition of homes. 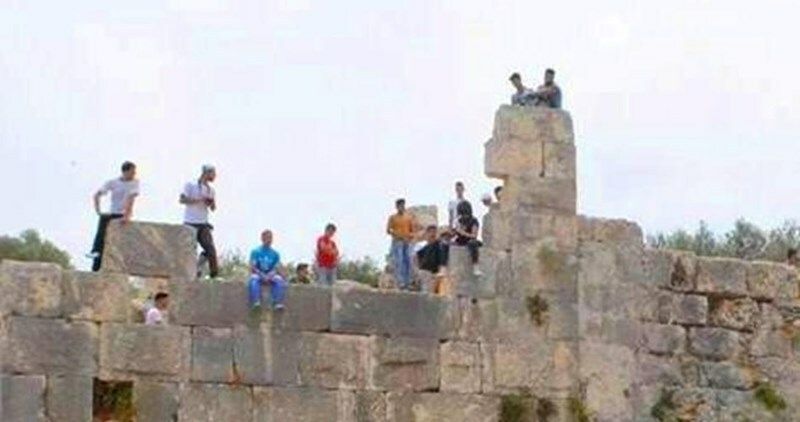 Palestinian inhabitants of the Deir Ballout town said Israeli bulldozers leveled the Deir Kalaa and Deir Samaan archeological villages in western Salfit. 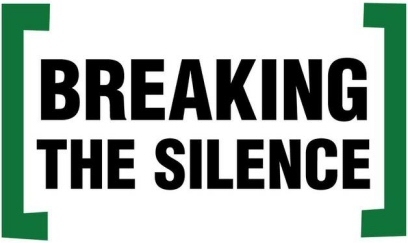 Eyewitnesses from the Brukin town also warned of the Israeli occupation authority's intents to isolate the Mughr al-Sahms village surrounded by the Ariel settlement factories. Farmers from Salfit province said the Khirbet al-Shajara village was completely dismembered from its neighboring towns due to the Israeli apartheid wall. The Palestinian natives of the area could no longer access the water wells and fertile lands which their forefathers have been cultivating for thousands of years. Researcher in settlement affairs Khaled Maali said Israeli illegal settlement activity reduced several historical sites carved in stones and olive groves to rubble. 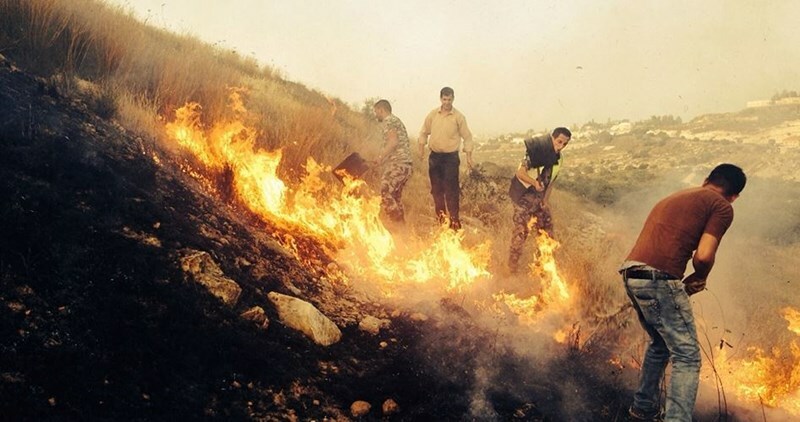 Jewish settlers set Palestinian agricultural land on fire in southern Nablus on Friday afternoon. The Urif village council chairman, Yousef Shehada, said that around 40 settlers from the Yitzhar settlement crept into the land cultivated with olive trees and set fire to the land lot. He added that the land lot was located in between Urif and Assira al-Qabaliya villages, adding that firefighters rushed to put off the blaze. 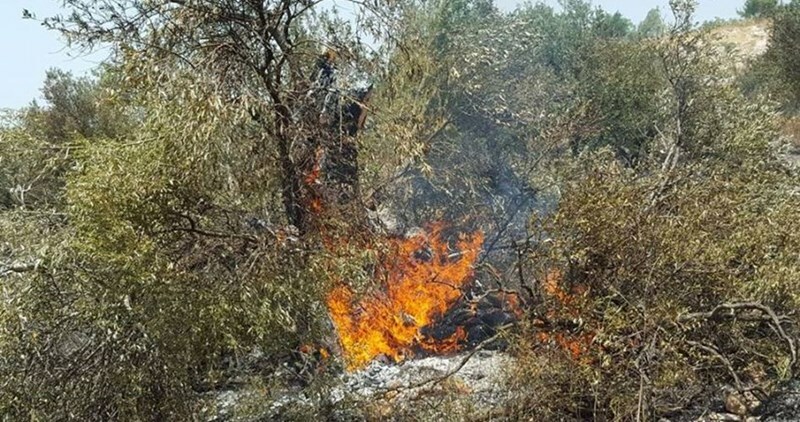 The Israeli Occupation Forces (IOF) set fire Monday afternoon to dozens of Palestinian-owned agricultural dunums planted with olive trees west of Ramallah. Local sources affirmed that Israeli forces deliberately set fire to dozens of dunums in Badras town west of Ramallah, burning dozens of olive trees. Palestinian farmers were prevented from reaching their agricultural lands to put down the fire, the sources pointed out. Two days ago, Israeli forces set fire to 8000 dunums of Palestinian-owned agricultural lands near Nejehot settlement illegally built west of Dura town in al-Khalil. The Israeli Occupation Forces (IOF) set fire to 8000 dunums of Palestinian-owned agricultural lands near Nejehot settlement illegally built west of Dura town in al-Khalil. Israeli forces were deployed overnight in large numbers near the settlement and carried out search operations for “wanted persons” who were allegedly planning to storm the illegal settlement. During the search operation, IOF soldiers heavily fired flare bombs which led to the outbreak of fire in the neighboring agricultural lands. The PIC reporter said that thousands of dunums planted with olive, fig, grape, and almond trees were burnt since the early morning hours. Israeli forces prevented the Palestinian civil defense crews from reaching the area and confiscated a fire truck while trying to put down the fire. The fire reached a nearby house owned by Jadallah family. Fortunately, the civil defense crews managed to evacuate the family members. However, three citizens suffered breathing difficulties. 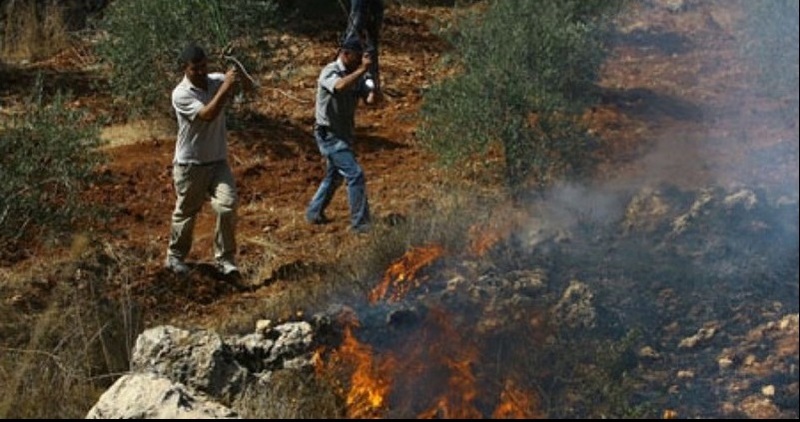 Dozens of Palestinian citizens suffered from inhaling tear gas and several olive trees went on fire during violent confrontations with Israeli soldiers on Saturday in Kafr Qaddum town, east of Qalqiliya city. According to Murad Shetewi, coordinator of the popular resistance in the town, the sky of Kafr Qaddum was clouded with thick toxic smoke because of the intensity of tear gas fired randomly by Israeli troops. Olive trees and grassland also caught fire as a result of stun grenades fired by the soldiers during the events. Shetewi said that Palestinian fire trucks were unable to reach the place because the road was closed with dirt mounds, which forced firemen to walk to the area and control the fire manually. The Israeli occupation army on Sunday seized and bulldozed about 50 dunums of cultivated land belonging to Palestinian farmers in Kafr Qaddum village, east of Qalqiliya city. 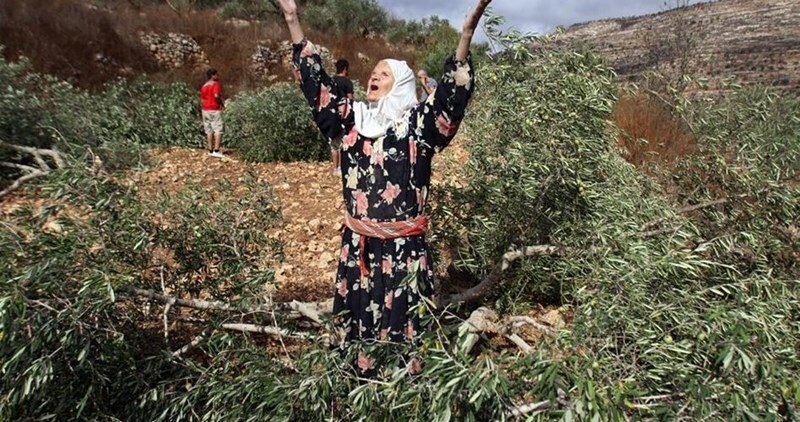 Coordinator of the popular resistance in the village Murad Shetewi said that Israeli bulldozers leveled 50 dunums of land and uprooted 50 fruitful olive trees belonging to two local residents at the pretext of building a security road for Mitzpe Yishai settlement. Every once in a while, the Israeli army appropriates and bulldozes vast tracts of Palestinian-owned land in the West Bank under flimsy security reasons. At least three Palestinians, including two journalists, were injured while dozens choked on teargas as Israeli Occupation Forces (IOF) suppressed Friday weekly marches across the West Bank. Local activist Murad Shteiwi told the PIC reporter that dozens of Israeli soldiers stormed Kafer Qaddum town amid heavy firing of teargas bombs and sound grenades and violently quelled the anti-settlement weekly march. Three injuries were reported during the attack including two journalists, while dozens suffered breathing difficulties due to the excessive IOF firing of teargas bombs, he added. During the march, Israeli forces deliberately targeted the journalists and their equipment, Shteiwi pointed out. Hundreds of locals and foreign activists participated in the weekly march while holding banners and chanting slogans calling for an end to Israeli occupation and settlement expansion. In a similar attack, dozens of Palestinians suffered breathing problems after Israeli forces suppressed Friday afternoon Bi’lin weekly march that was organized against Israeli settlement construction. Dozens of olive trees were burned due to the excessive firing of teargas bombs during the march. 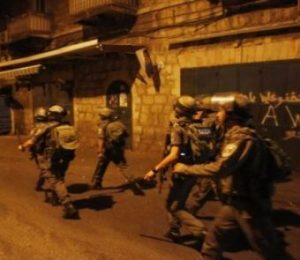 Meanwhile, nine rubber bullet injuries and 23 teargas suffocation cases were also reported as clashes erupted in Abu Dis town east of occupied Jerusalem.